At one point in time, they were a most treasured gift -- at least by the giver: A warm, Christmas themed sweater. Proudly worn from Black Friday, 'til just after the New Year, these polyester, tinsel, bauble, and tinsel adorned creations, were a big fashion hit in the early 1980s. Fast forward to 2013 -- and they are mocked like a Ron Burgundy appearance at the News and Documentary Emmy Awards. 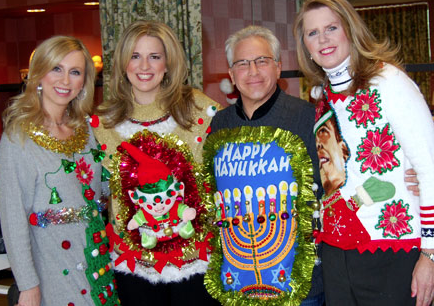 So it's good to know that the team at Witherbee's Carriage House: Bill, Patty and Amanda Christian, have a terrific sense of humor, as they dedicate an entire evening to the sacred art of the "Horrid Christmas/Holiday Sweater".